Divorce has its goods and bads, positives and negatives, and hopefully it can at least be an easy transition for everyone involved. One of the positive aspects of divorce for me, is that I get built in “break time”, when I can tend to my own needs first, as opposed to the needs of my children. I can’t say enough how blessed I am (and how blessed my kids are), to be in the post-divorce situation that I am in. I get a couple breaks a week, every other weekend, and a few full weeks out of the year. My kids benefit just as much from the breaks as I do, and spending that kind of quality time with their Dad is brilliant and so meaningful. Sure, I always have these elaborate ideas of what I will do with my break time, especially when the kids are gone for a week, for example. I fantasize about flying to some far-off island, cleaning out my closets, cleaning out their closets, getting rid of the toys they say they want to keep but haven’t played with in years but can’t bear to let go of, yeah, those kinds of plans. Sometimes I manage to pull some of it off, and other times, it’s just awesome being home without much of anything going on. This past week, my kids were gone, and I definitely took advantage. I took naps, had massages, walked around nekkid, sang out loud (well, louder than I usually do), ate what I wanted when I wanted, had friends over without complaint. I got to lounge by the pool without having to worry about anyone drowning! (That’s huge!) It might not have been as productive as I would have liked, but the chilling out was lovely and much needed. And it was quiet. So quiet, that every time the AC kicked in, I jumped a little. So quiet that when the ding from the elevator down the hall sounded, I wondered who might be coming. So quiet that I realized as much as I was enjoying my downtime, I missed my boys. Sure I have my pup, and he’s great company when he’s not begging for food or begging to be pet, but I realized he missed the kids, too. That was painfully obvious yesterday when I mentioned their names, my dog started wagging his tail and headed straight for the door. 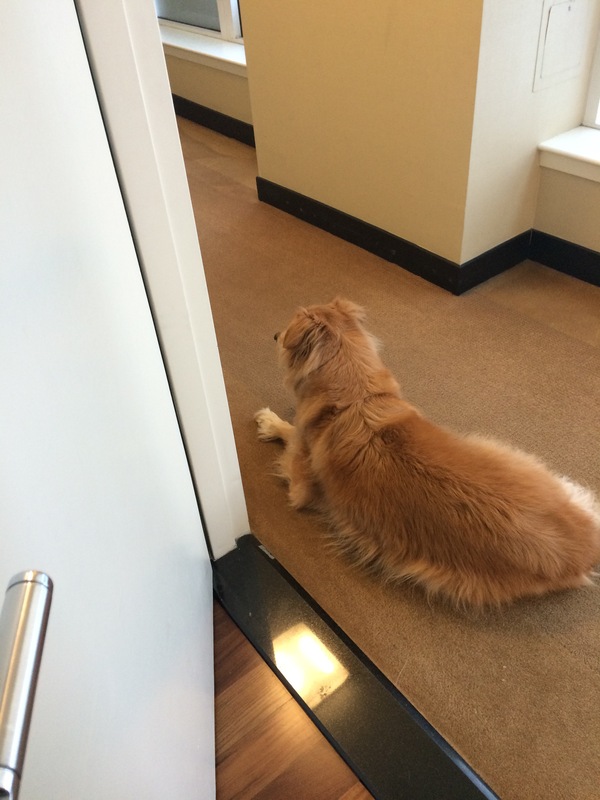 Here he is patiently waiting the boys’ arrival. The boys finally arrived, all three a bit taller, and a bit tanner, and as miraculous as ever. Yes, miraculous, because they’re mine, and my heart explodes every time I see them after they’ve been away (well, every time, really.) Within minutes, the dog was barking, my middle and my youngest were quibbling, my oldest was playing the guitar. There were shoes and flip flops strewn across the floor, computers zinging to life, and televisions offering discounts if you ordered now. It was loud, it was chaos, and it was the most beautiful noise I had heard all week. My boys are like Totems to me, because I am certainly calmer when they are around, but it always helps to have an actual Totem as a reminder to keep calm. If you need a Totem, head over to our store, and get one today!